electro-music.com :: View topic - Can anyone suggest an LFO...? Can anyone suggest an LFO...? Posted: Sat Feb 21, 2009 10:52 pm Post subject: Can anyone suggest an LFO...? I'm looking to whip up a fairly simple LFO with just one knob - for rate. I'd like a triangle waveform with perhaps sine and pulse if that wouldn't complicate things unduly. They don't have to be simultaneously available. Also, if possible, I'd like to be able to reset it with a footswitch, and it'll be powered by +/-15v. Do those things sound like any LFO already out there? Bonus points if I can use some of the 555s I have sitting around here. Though that's not a big sticking point, by any means. Here's my ultra simple LFO that has speed and skew pots. The skew pot changes the triangle output from up-ramp to triangle to down-ramp and the square output from narrow to square to wide. Mine is running off +/-9V with an LM324 doing the business, but pretty much any quad opamp should work and +/-12V or +/-15V should be fine. LM324s can't handle more than +/-15V. The output is about +/-3V, so 6V p-p. That is determined by the blue LEDs. Green LEDs will give you lower voltages, or you could put multiple LEDs in series to achieve higher voltages. Get them from the same batch or match them if you care about symmetry in the output. The stripboard layout is missing the 1N4148 diodes, because I have them hanging directly off the back of the pot. 1uF for the main cap gives typical LFO type speeds, but if you want a really slow or fast LFO, you can try a bigger or smaller cap in there. 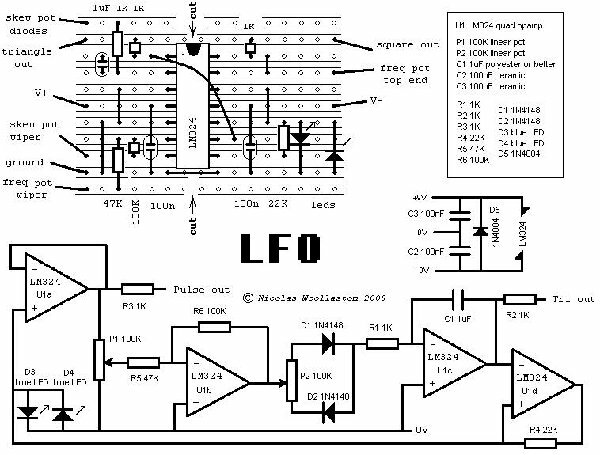 I also have a voltage controlled LFO design that I will post once I have tidied up the drawing. First your ADSR and now this... I love your stuff man! First off: Thanks! I've got all the parts here and I'm going to give it a go. 1) where does the IN4004 go? 2) the point labelled "skew pot diodes" goes to *both* outside lugs of the 100k pot, does it? 1N4004 links the pos. and neg. power rails. It's right below the legend posted. I like the skew function! Very usefull. And thanks for posting a stripboard layout - good for clueless starters like me. Can the pulse and tri outs be used at the same time? And why does putting LEDs in series lead to a higher voltage? The 1N4004 is optional and just to protect the chip against a power supply reversal. I have missed it out on the stripboard layout, but if you want to add it, it goes across the chip from pin 11 to pin 4. The wire labelled "skew pot diodes" goes to the junction of the two 1N4148s, which then go to outside lugs of the 100k pot. Look at the schematic. Both outputs can be used at the same time. The voltage drop of the LEDs is used to set the voltage levels of the schmitt trigger. So replacing each LED with two in series doubles the voltage at which the thing switches over from charging the capacitor to discharging. So I made it using what I had lying around, which was all the recommended values except for the LEDs - one's red and one's clear. The waveform is a bit "lopsided" as you'd expect. Otherwise everything seems to do what it should so far except for the rate, which goes from about 1Hz up to about 8Hz. Is that how it should be or have I missed something? Or could that be affected by the uneven LEDs? Yes a pair of blue or white LEDs will cause it to run about twice as slow as red. With a bit of tweaking it should be possible to get it to run from about 0.1 to nearly 10 Hz. The lack of range on the slow end you are seeing could be due to your speed pot not giving you a smooth taper all the way down to zero. Is it a good quality pot? To fine tune the range you can also reduce that 100K resistor (R6) to make it run a little slower. 0.1-10Hz would be great for my purposes. The pot's a brand new Alpha. I'm inclined to think the problem is elsewhere. I was having trouble with the pot cutting all sound at lower settings, so I removed the connection from the rate pot to the spot labelled "freq pot top end" and it seemed to get rid of that problem. So right now the wiper is connected to "Freq pot wiper" and lug 3 is connected to the wire linking LEDs and Ground. Maybe it's my "fix" that's causing the problem...? Thanks for the help, btw! I don't quite understand where you currently have yours connected up to. It is possible that the stripboard diagram has an error, but the schematic is definitely correct, so if in doubt please refer to that. Got it. I forgot to put in the jumper across the bottom of the IC socket. I also changed the LEDs to standard blue pair. Now it works as it should with the recommended wiring for both pots. Here is another very simple LFO, this time with voltage control over the speed. It adds voltage control without being any more complex. But it has the disadvantage that the skew control isn't as well behaved. In the 1st LFO above you can change the skew without significantly affecting the speed, but with this one as you change the skew pot away from symmetrical it slows the LFO down. And the skew pot itself isn't linear in the way it moves from up-ramp to triangle to down-ramp. 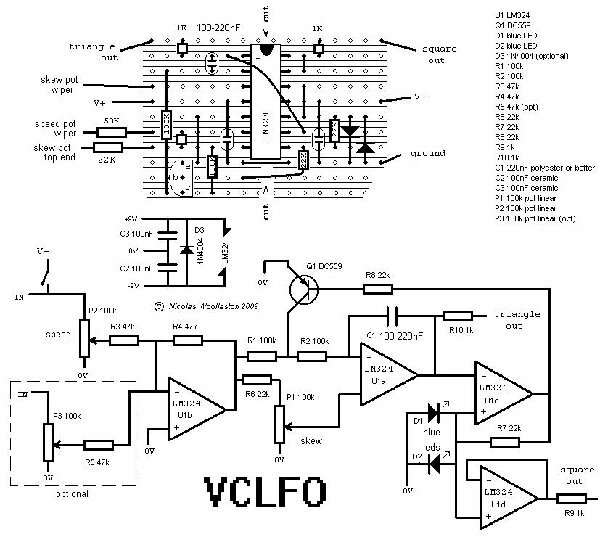 So the 1st LFO is better suited to being the sensible stable master LFO to keep a constant tempo, while this VCLFO is better suited to crazy life-giving weirdness-injection type tasks. An older brother, younger brother kind of thing. 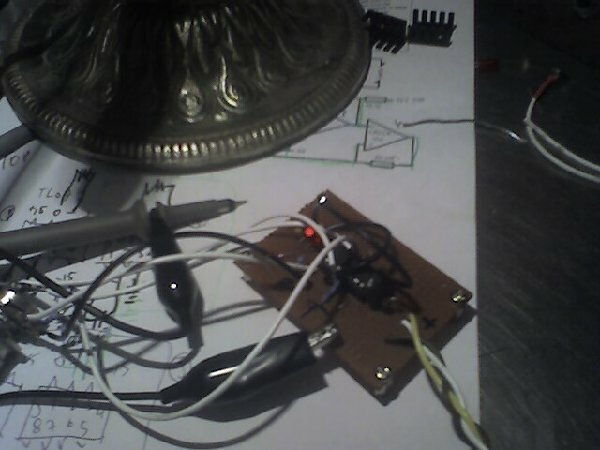 I have only designed this recently and have not tested this circuit as thoroughly as the first one, but it has been built and does work (at least here in the southern hemisphere it does anyway). do you think a capacitor and a switch could be add to get a low range mode? Isn't the skew acting as a comparator? Couldn't ya stick a CV input on the U1A non-inverting input? Yes, good idea. You really need an extra opamp for that because you need to ensure that the U1a + input gets a voltage somewhere between roughly 0.1 and 0.7 times the voltage at the output of U1b (which is negative). Otherwise the thing won't oscillate. Symmetrical oscillation occurs when that ratio is 0.33. An extra opamp and a few diodes might do the trick. Or you could do it better with a multiplier like an LM13600. I have been thinking about the +/-15V question with regard to the VCLFO. It might be okay, but you may need to put in an additional protection diode for the transistor. At +/-9V supply it gets subjected to about 7V of reverse voltage which it seems to handle in practice, but is actually slightly in excess of what the datasheet recommends. With higher power supply voltages the extra reverse voltage might be too much for it. Posted: Sun Mar 08, 2009 1:41 am Post subject: Can anyone suggest an LFO...? Here's one of the LFOs I've cooked up recently. This runs on a +/-15V supply and puts out standard +/-5V outputs. For the most part, it's a basic triangle oscillator built around a comparator and an integrator. I wanted something with a LOT more range than the other LFOs I was finding, so I made a few tweaks and came up with a design I really liked. This one goes from 0.017Hz (1 cycle / 60 seconds) to 150Hz, or a factor of 8,800:1 (hence the name). 1) You can use Linear pots for the tuning controls, but it's MUCH easier to make fine changes in the lower portion of the range with Audio taper pots. 2) You can eliminate the Fine Tune control if you want. This reduces the range to 0.033Hz to 150Hz (approx 4,400 : 1) but this will probably do the trick for many applications. 3) The Fine Tune pot is set up so that it really does have less range than the Coarse Tune. When Coarse is at maximum, Fine will adjust from 50Hz to 150Hz. When Coarse is at minimum, Fine will adjust from 60 sec/cycle to 30 sec/cycle. I'll be making a few additions to this (sync, additional waveforms, Indicator LEDs), but the basic core will remain the same. Any thoughts? Servo's 8K LFO - Updated with A and B points for waveshaper operation. 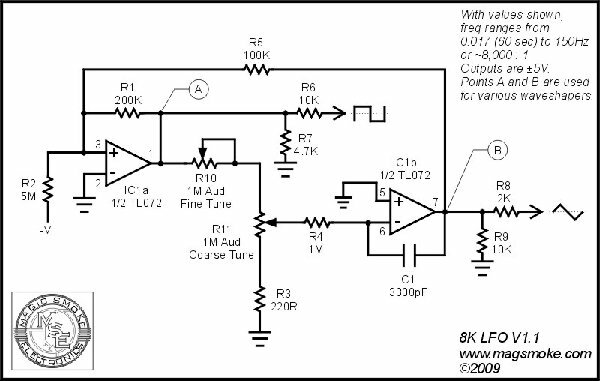 Posted: Sun Mar 08, 2009 9:49 pm Post subject: Can anyone suggest an LFO...? Here's a coupla add-ons for the 8K LFO. The first (TSW) uses the Tri and Square to make a Saw, or even a 2X Saw. The second (TSQ) takes a Tri and puts out a wave that is continuously variable from Tri to Square, with a "Trapezoid" shape in the middle. 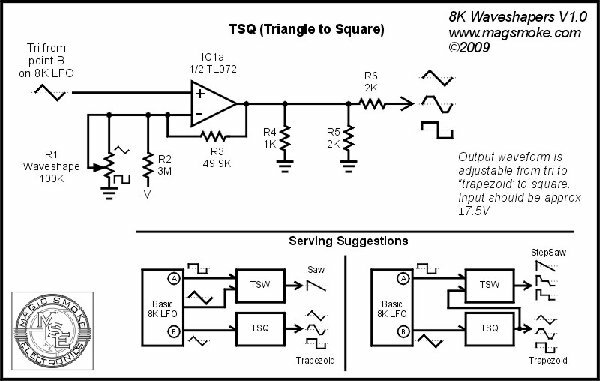 You can even take the output of the TSQ and put it into the TSW, and now you have a Tri to Square on one output and a Saw to Square on the other (both varied at the same time with the Waveshape control on the TSQ). By the way, a 1458 or other "low bandwidth" op amp works a little better for the TSW because it helps minimize the glitch in the reconstructed Saw output. I've got some more add ons that I'm still working on, but I thought I'd throw these out here because these variable outputs are so much fun. Tim, could these waveshapers be used with Nicolas' simple VCO too? Posted: Fri Mar 13, 2009 11:07 am Post subject: Can anyone suggest an LFO...? These waveshapers should work with just about any triangle core oscillator. 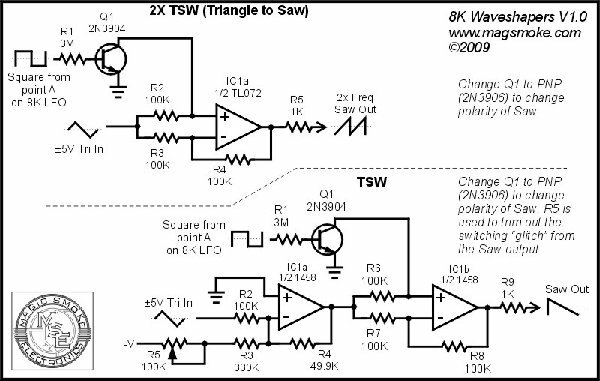 The TSW and the 2XTSW expect a +/-5V input, and need the square wave to be 90 degrees out of phase with the triangle (which happens naturally in integrator/comparator triangle cores). This also works with our 566-based TH-101 VCO (as this is how I generate the saw output). I don't know if the TSW would work with 555-based oscillators, but my guess would be 'yes.' The TSQ works best with an input a little hotter than the standard levels, so I tapped a +/-7.5V triangle from the 8K core. BTW, I'm working on voltage control for the waveshape on the TSQ. So far I have it working very nicely with a Vactrol, but I want to see if I can get an FET or perhaps a VC current sink to also do the job. Stay tuned.